I know what it feels like to be stuck. I was once an unemployed single mother with a beautiful nine-month old son having walked away from an emotionally abusive marriage. Although I was committed to personal growth, I was still trapped in negative cycles. I wanted a mental overhaul, but wasn’t getting the results I sought. I tried a variety of approaches that did not give me the changes I wanted. My dissatisfaction led me to create my own solutions. 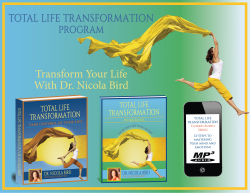 That is how I came to develop a distinct and effective approach for personal transformation that creates deep-seated change from the inside out. I saw the benefits of my process immediately. They were so powerful that by applying my techniques I was able to complete three degrees—my undergraduate and two graduate degrees (M.Ed. and Ph.D. from the University of Toronto) in a record 6 ½ years all the while establishing my transformative approach to psychotherapy called Self-Imaging Therapy (SIT)™ and raising my son as a single mother. I’ve discovered through my practice that people have the same ingrained self-defeating responses to fears and challenges. These are deeply embedded mindsets that they rarely know exist but that keep them stuck in the problem they’re trying to change. I originated specific techniques to generate change that everyone can use to succeed at everything they do.